Last Update: 2015-10-09 - Major Update: Improved data collection module, support for latency, added device plugins for motions sensors and total stations. 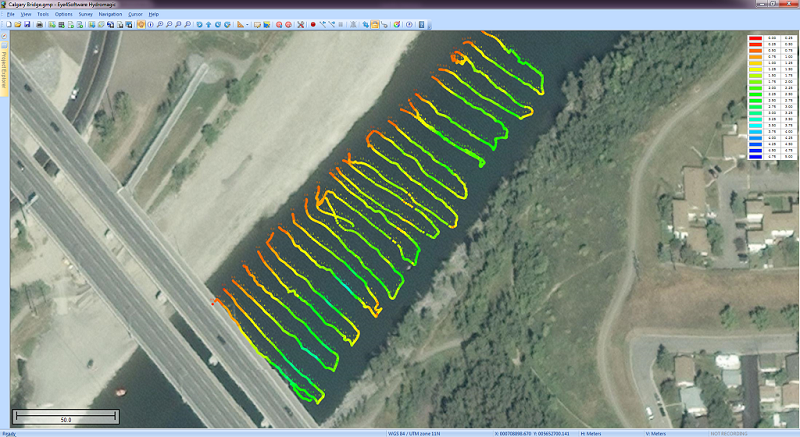 Eye4Software Hydromagic is hydrographic survey software for Windows. It can be used to generare depth maps using a GPS or RTK receiver and an echosounder or fishfinder. After recording the sounding, you can generate DTM's (Digital Terrain Models), depth contours, 3D views and cross-sections. It offers various methods of calculating volumes of bassins, ponds, river sections and lakes. The software is capable of reading and writing most popular CAD, GIS and nautical chart formats, including: GeoTIFF, Microstation DGN, ARC/INFO, MapInfo MIF/MID, AutoCad DXF files, IHO S57/S63 Electronic Natutical Charts, Google Earth KML/KMZ files and ESRI shapefiles. A wide range of map projections is build in. More then 5000 map projections are built in. In addition, NTv2, NADCON and HARN correction grids are supported. The software is also able to calculate tide levels in real time by using a RTK receiver connected to the PC. Using the antenna height, antenna offset and a geoid model, the tide level is calculated and applied to the sounding, resulting in a height values relative to the local vertical datum. When no map is available for your area, you can use the build-in map downloading tool. Use OpenStreetMap, Google Maps or Bing maps as background maps. Since this latest version, the software can be used to collect and process dual frequency sounding data, as well as additional sensor data, such as magnetometer data, or advanced data from echosounders, like reflectivity or bottom-loss. Another big improvement is the use of shorelines. Shorelines can be used to add data collected near the shore, to create islands or to clip your DTM data, by just by specifying on which side of the shoreline the water is. For the people who want to perform their survey by using planned lines, there is also good news: It is now possible to calculate a DTM or depth contours from multiple soundings or shorelines. Just press a single key to start a new line !